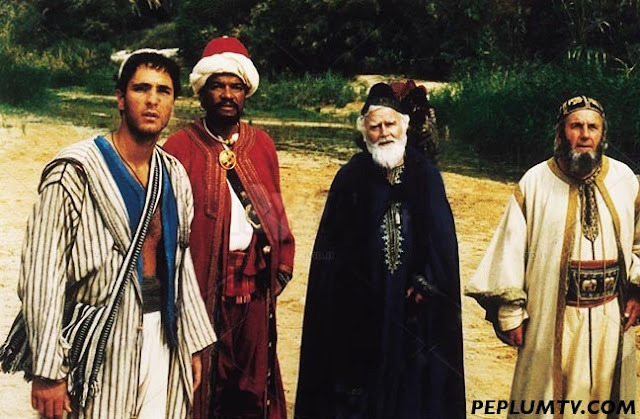 Based on the story of the Three Kings in the Bible, this story speculates that there was a fourth king, played by a young Bova. The copy I have is in Italian so I didn't get every detail from it. It's cute, and is more fairy tale than anything else. The existence of this movie sorta highlights the few films made based on the birth of Jesus. A big budgeted production, styled like a PEPLUM, would be amazing. Raoul Bova is very popular actor in Italy.Happy Holydays! Though I'm not a Christian myself, I do enjoy Biblical epics, big and small. It's fascinating to see how filmmakers keep turning the old tales over and re-telling them from every conceivable angle. Atheist Richard Dawkins was once asked how he could listen to classical music with a religious bent when he wasn't religious himself, but that has nothing to do with it. Art can be enjoyed for its own sake. In fact, I think the very preachy and grand "The Ten Commandments" is higher art than the pondorous "Exodus: Gods and Kings", which tries to rationalize the various miracles and supernatural events.